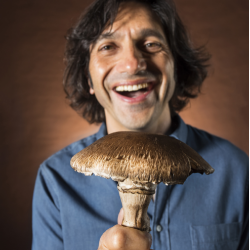 The Marsh San Francisco Presents "The Mushroom Cure"
The Marsh San Francisco announces the return of its 2017 hit, The Mushroom Cure by Adam Strauss. Inspired by a scientific study that hallucinogenic mushrooms may cure obsessive-compulsive disorder (OCD), Strauss embarked on a program of vigilante psychopharmacology. The true tale of Strauss’ hilarious, harrowing, and heartrending attempts to treat his debilitating OCD with psychedelics was an Off-Broadway hit, where it was named Critics’ Pick by Time Out New York and hailed by The New York Times as “mining a great deal of laughter from disabling pain” before moving to San Francisco for an extended run.